When Dylan had to fly down to Melbourne for work there was one thing on my mind, a sneaky weekend feasting in one of our favourite cities. And so it came to be that I flew down to Melbourne on Thursday and headed straight for Hare & Grace. Hare & Grace was Raymond Capaldi’s restaurant located in the forecourt of the Rialto. Sadly the restaurant has closed since our visit as the owners of the Rialto decided to develop the forecourt and Capaldi sold his business to them. 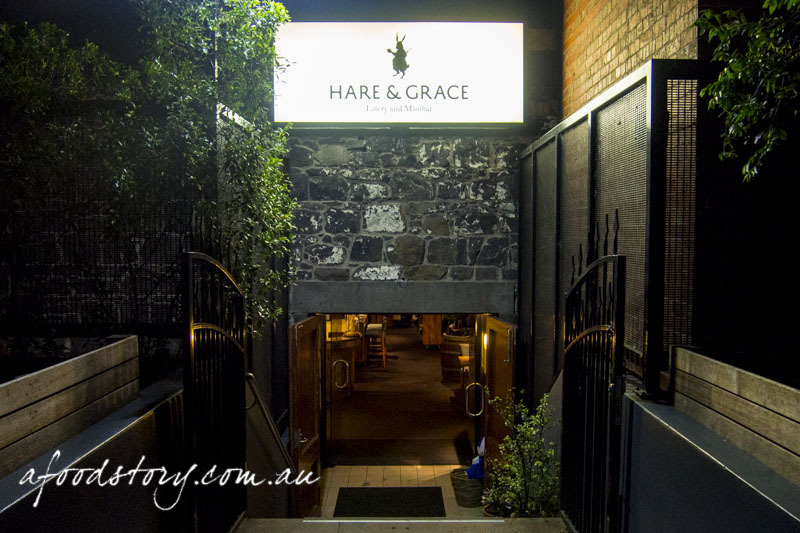 It’s a sad state of affairs indeed as Hare & Grace was one of the best meals we experienced in 2014. 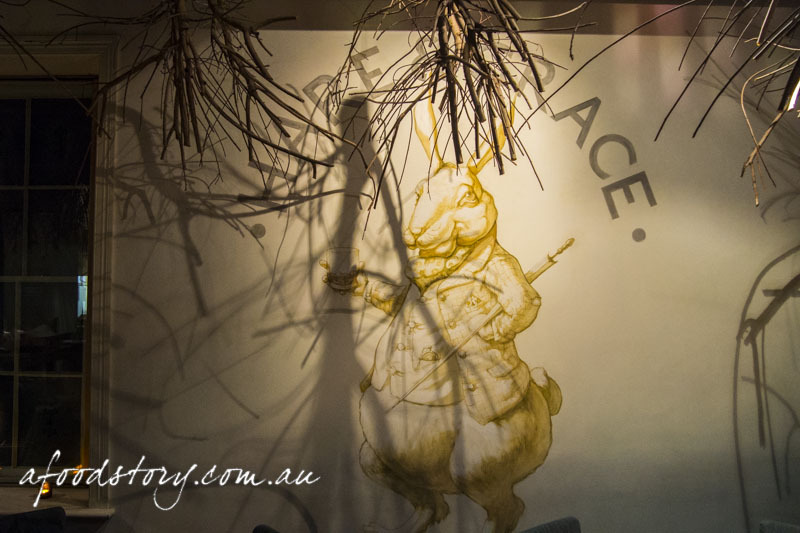 Stepping into Hare & Grace is like falling down the rabbit hole. Designed by Joost Bakker of Greenhouse by Joost fame, the space is dimly lit, there are bunches of twigs hanging from the ceiling (roots to the world above? ), the tables are large and rustic and the walls are bedecked with sketches of animals. Our waiter was friendly and extremely knowledgeable without being overfamiliar. Upon hearing I wasn’t drinking for the evening he asked about my likes and dislikes and came back with a mocktail that suited me to a tee. He also chose the perfect wine to accompany Dylan’s meal. Flying down to Melbourne mid-afternoon I’d missed out on a proper meal for lunch and was famished. 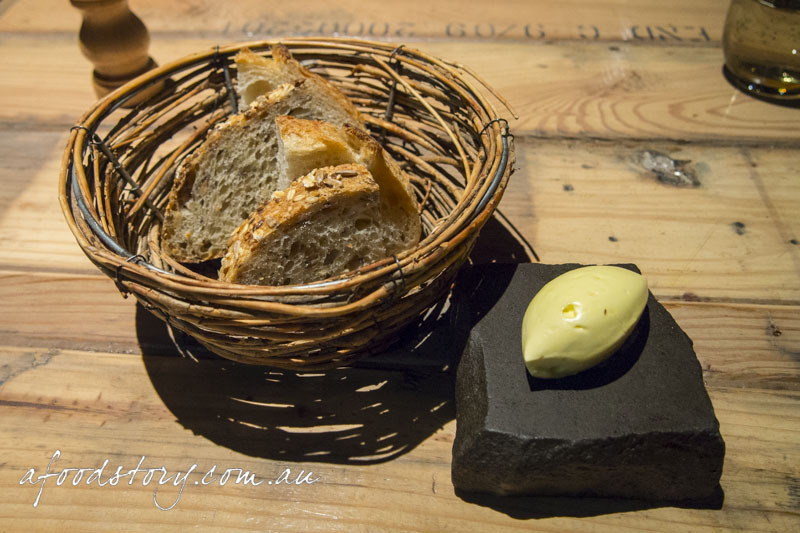 With perfect timing to avoid turning hangry a wicker basket of sliced sourdough and soy & linseed bread arrived, accompanied with a quenelle of butter. Super fluffy with a beautiful crust the bread was delicious on its own but even better smeared with the butter that had been whipped with honey. DEHYDRATED CARROT, ORANGE PEEL, WALNUT ($21.00). It was curiosity that made me choose a vegetarian entree. 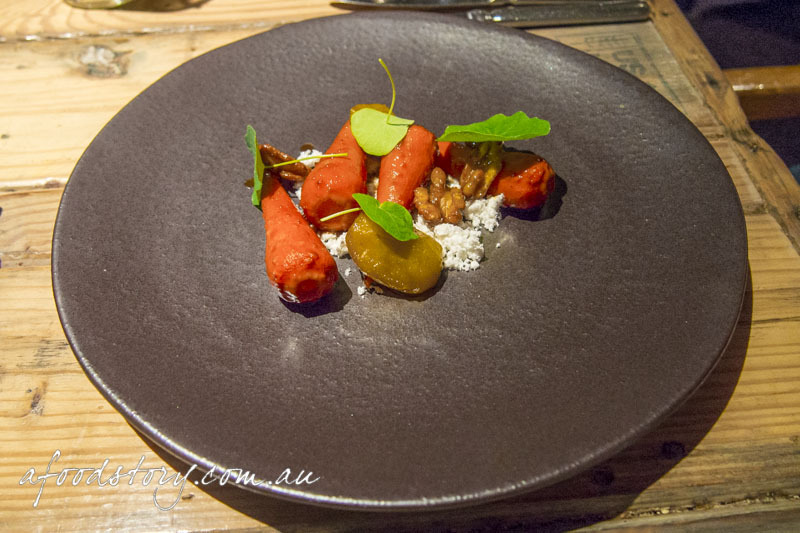 I was curious to see how a dish of dehydrated carrot with orange peel and walnut would be served. A bed of walnut powder made using maltodextrin was our first glimpse into the world of molecular gastronomy that Raymond Capaldi is known for. It smacked my senses with the essence of walnut but then disintegrated moments later. Glazed carrots, dehydrated for an hour and cooked in veal jus (not a vegetarian dish after all) saw the natural sweetness of carrots enveloped in the buttery, savoury jus. While apple infused in orange sherry vinegar added sweetness kept in check with acidity. Each component on its own was outstanding but combined to produce a spectacular dish of earthy character with hints of sweetness and nuttiness. CONFIT SPRING ONION, WHITE PROSCIUTTO, MUSHROOM KETCHUP ($18.00). Meanwhile the promise of white prosciutto – aka lardo or pork back fat – was too much for Dylan to go past. A plate of beige contrasted my bright starter and I wasn’t sure what I would think of Dylan’s dish. Spring onion, both raw & crisp and roasted & buttery, brought contrasting textures and onion flavouring which married well with the ‘mushroom ketchup’ of shiitake cream vinaigrette, all of which helped balance the unctuous white prosciutto. In similar fashion to my entree we loved each element though the white prosciutto that simply melted on the tongue was clearly the star of the dish. 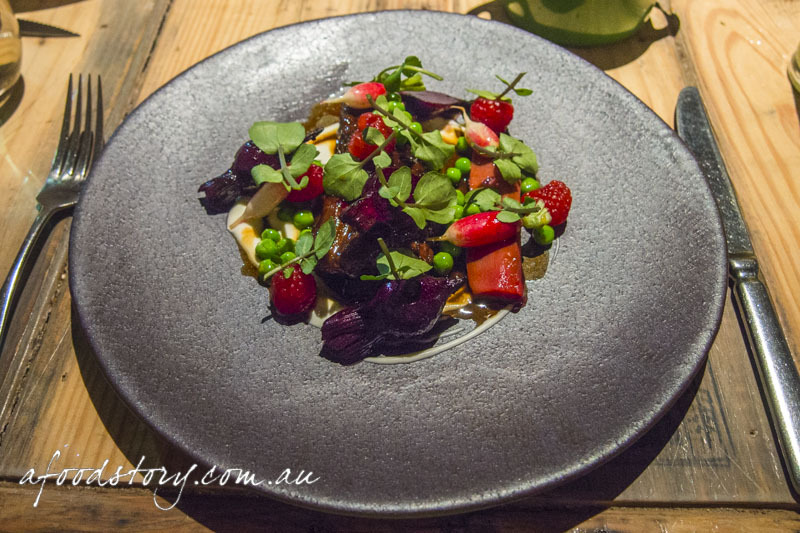 NAVARIN OF LAMB, RASPBERRY, PEAS, BEETROOT, WATERCRESS, MINT YOGHURT ($39.00). Although tempted by the selection of steaks on offer I couldn’t go past the lamb. A navarin is a French ragout dating back to the 1800’s and the perfect dish for Spring lamb. What I wasn’t expecting was a dish plated as prettily as this. Tender and succulent the braised lamb was the perfect partner for tart raspberries, zingy peas, earthy beetroot, peppery watercress and the mint yoghurt. Each accompaniment added its own flair to the dish but I waxed lyrical about the lamb and raspberry combination for days afterward. 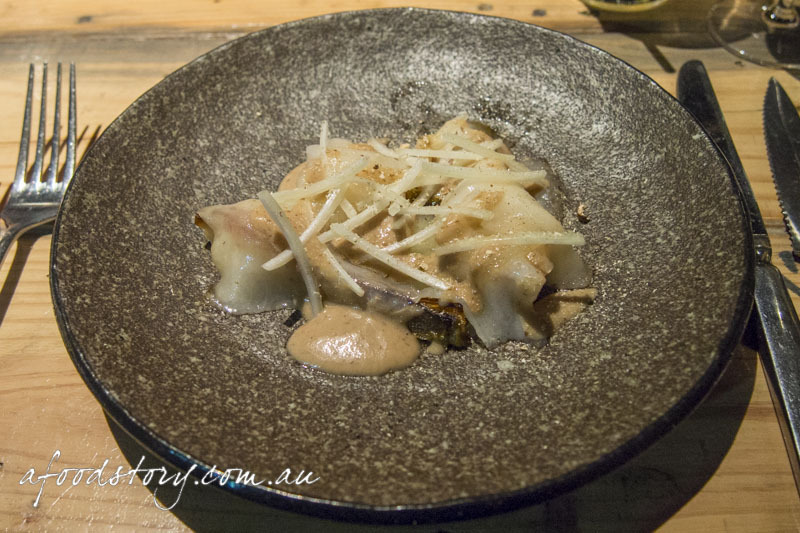 This dish is what it’s all about – great produce, technique and marriage of flavours. Happiness on a plate. 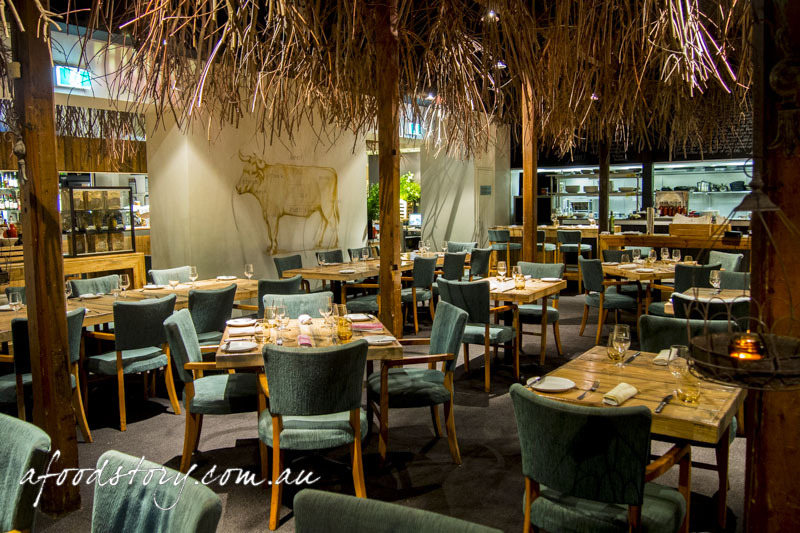 100 DAY PASTURE FED, PREMIUM ANGUS SIRLOIN, 300 GRM, CLARE VALLEY GOLD, SA ($41.00). No points for guessing what Dylan’s main of choice would be – beef of course. The only question was which cut? With a Sher Wagyu burger, Angus eye fillet (grain fed), Angus sirloin (pasture fed) and rib eye (grass fed) all options. Pasture fed was the in-between and how Dylan settled on the Angus sirloin. Accompaniments also had to be decided upon but with so many options Dylan agreed with our waiter’s suggestion of both the horseradish and the chimichurri which Dylan’s been addicted to of late. 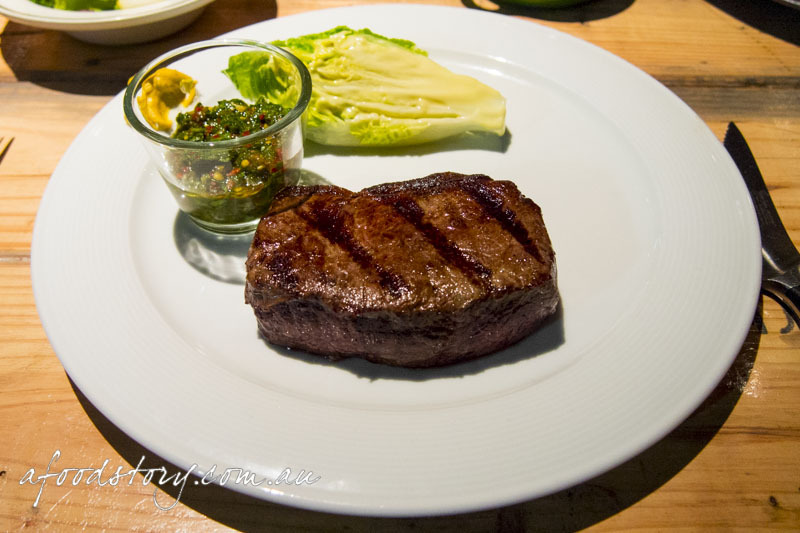 The sirloin was cooked superbly, flavourful and tender, and I loved the intensity of the char. 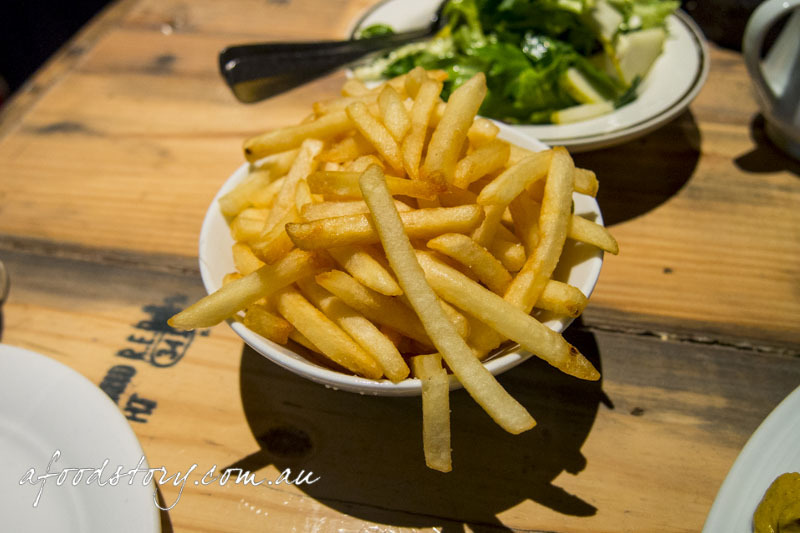 Accompanied by a bowl of wonderfully cooked shoestring fries and another bowl of butter lettuce this was a generous main meal and saw Dylan a very happy man. 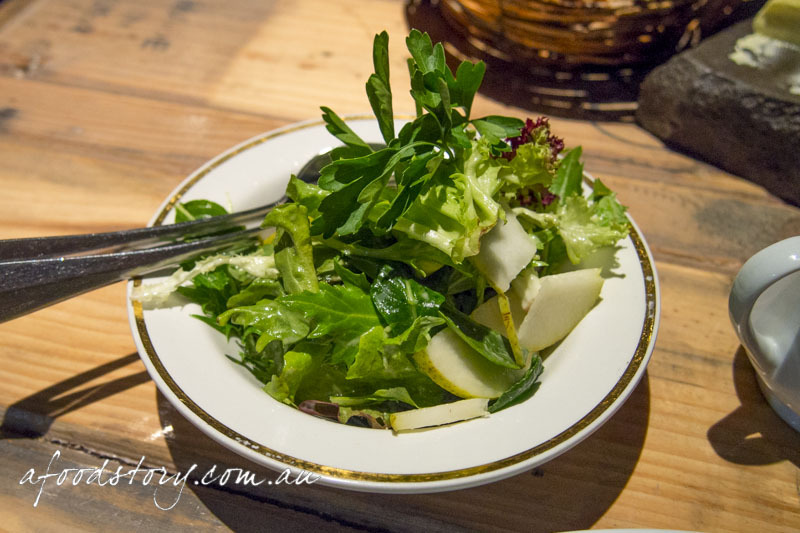 MIXED SALAD LEAVES, PEAR, WALNUT VINAIGRETTE ($10.00). Dylan always likes a refreshing salad with a rich beef dish and so a side salad was required. What he didn’t realise at the time was his beef was already accompanied by butter lettuce dressed in a vinaigrette and so the side salad was redundant. Yes it did its job and the pear and walnut was enjoyable, though not for me and Dylan felt it wasn’t worth the money. MASH ‘N’ GRAVY, 50/50 UNSALTED BUTTER, MEAT JUICE ($10.00). I absolutely love mashed potato and thought there would be nothing better than a side of mash to go with my lamb. Our waiter agreed and so I felt no guilt in ordering a bowl of mash all to myself. Hare & Grace’s mash ‘n’ gravy is half potato and half butter. Yes, you read right. Half butter. This bowl of decadence is quite simply heaven on earth. But it’s not just the creamiest mash ever, it’s also doused in meat juices. Quite possibly the best mash I have ever eaten. 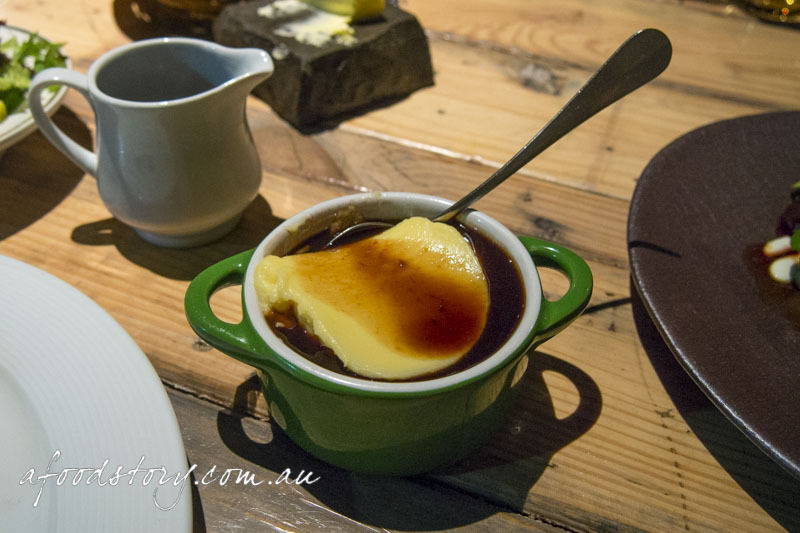 Better than the truffle mash and Paris mash I’ve eaten in some of Sydney’s top restaurants. Vegetarians you’re absolutely missing out. 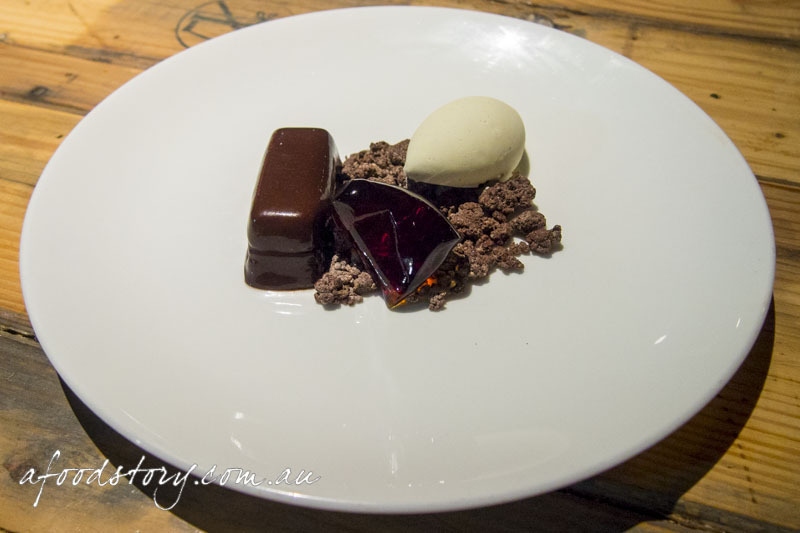 PAVE OF CHOCOLATE, TRIPLE MILK SORBET, PEDRO JIMENEZ JELLY, CHOCOLATE SOIL ($15.00). Dessert to be shared can often be a difficult decision but not this time around. Chocolate for her. PX for him. A great combination the pave of chocolate was lush and decadent, softened with the triple milk sorbet and indisputably PX jelly. Each element on its own was completely awesome but together made for one of Dylan’s favourite desserts and one we’d both happily devour again and again. Ending a meal with a coffee is the perfect digestive and almost a must as far as I am concerned. While not a huge fan of Vittoria beans when there is a good barista involved it can be a decent coffee which was the case here. 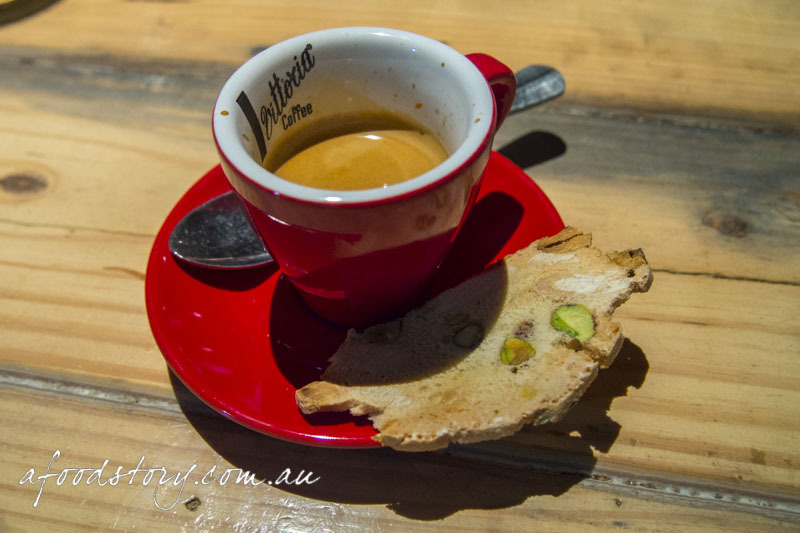 Served with a piece of pistachio biscotti and you can be sure I was a very happy customer. Sadly Hare & Grace is no more and we only dined there once during its five year existence but that one meal was one of our favourites of 2014. Capaldi signalled he was stepping away from the kitchen, though we since hear he’s joined A25 Pizzeria. You all know how much Dylan and I love our pizza so no doubt that will make its way on to our Melbourne eating wish list.